Vegetable cultivation at Lake Naivasha, Kenya. Africa is ripe for its own industrial revolution, but with 70 percent of Africans dependent on agriculture for their livelihoods, it must be a green one. We have been latecomers with the world's previous waves of industrialization; now we are catching up because necessity and the birth of new technologies are fostering a continent of innovators. The green agricultural revolution here is well overdue. With more than 874 million hectares of arable land - nearly six times as much as in the United States - Africa has the opportunity to ensure food security for all without repeating the environmental mistakes made by advanced economies. Statistics in the 2016 United Nations Economic Report on Africa (ERA) show a path to environmentally sound industrialization. Investing in infrastructure so that people can power their homes with greener energy without chopping down trees will be key. With the increased wealth that an agricultural revolution might bring, we need to be conscious of not squandering our natural resources. Therefore, green power and improved livelihoods must go hand in hand. If we adopt a green agenda to improve urbanization, energy developments and population growth, the report says, GDP per capita would more than triple to $14,000 and the number of Africans living on less than $2 a day would nearly halve to 350 million. Africa's green industrial revolution has to use the continent's abundant renewable energies. Africa consumes less than 3 percent of the total energy produced globally and accounts for less than 4 percent of total greenhouse gas emissions, yet it needs more energy to industrialize. Currently, Africa uses only 2 percent of its renewable water resources and has potential to increase hydropower generation. Greening is not just about honoring United Nations environment agreements made at the COP21 Paris climate change talks last year, or the decisions made at COP22 which will take place in Marrakesh in November. It is about combining industrialization and technological advances that protect our natural resources in the production process. If we get this transition right, women in particular stand to benefit. Rural women constitute the majority of the 80 percent of agricultural production coming from small farmers, yet they have limited access and control over the means of production. With proper training, these women could boost productivity and boost their earnings, thus lifting the economy. I was entrusted with the responsibility to implement a strategy focused on health, education and financial inclusion for Ecobank Foundation, a branch of one of Africa's largest banking conglomerates dedicated to funding social projects. 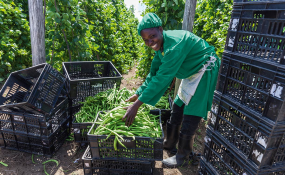 While it will be possible for us to make progress with our partners, we will not reach our full contribution to society until our collective investment is matched with jobs along the value chains of Africa's agricultural resources. Jobs are the multiplier effect of social investments. Unless more Africans are joining - and being retained in - the labor market, transformation will remain an elusive concept for many Africans. I am confident that my generation can deliver on the jobs promise, the same way our forefathers did on the promise of independence. We have managed to solve everyday problems by "innovation out of necessity" in places where energy is lacking. We can do the same for our agricultural revolution that holds the key to unlocking jobs in new sectors. With Africa's population projected to reach 2.4 billion people by 2050, current and new jobs will have to come from agriculture to quell persistent high levels of informal employment accounting for as many as 80 percent of jobs. Technology can help, as we have seen with M-Pesa, a mobile money transfer. With adequate regulation, M-Pesa could give rise to a mechanism to finance the green revolution. For example, InVenture delivered 200,000 loans in Kenya with repayment rates above 90 percent by using mobile data to create a financial identity for borrowers. We have already seen how this can translate into agricultural development. In Zimbabwe, an e-voucher program helps cash-strapped small-scale farmers buy agricultural inputs. In Nigeria, an e-wallet program allows farmers to receive vouchers for subsidized seeds and fertilizer. In Senegal, the Mlouma online platform connects farmers to food purchasers by displaying real-time market prices for their location. In Ghana, cocoalink connects cocoa farmers with information about good farming practices. In DRC, Mobile Agribiz uses web and mobile technologies to improve access to agriculture information and market accessibility for small farmers. In Africa, we have adopted alternative technology to address our limitations. Greening Africa's industrialization will allow us to reach our full potential without relying solely on unpredictable commodity cycles. In doing so, we can create jobs and move up the value chain, both on the continent and in the global marketplace. We have access to technology as we learn to distance ourselves from raw materials extraction. Though the conditions have changed, we have a window that we cannot miss if we are to reap the benefits of our investments in Africa's transformation. Carl Manlan is the Chief Operating Officer of Ecobank Foundation and a 2016 Aspen New Voices Fellow.